Illiana Christian High School in Dyer will move to a new $25 million campus near Shoe Corner at the intersection of 109th and Calumet Avenues from From 2261 Indiana Ave.. Scheduled for completion by fall of 2018, the new campus, received approval Nov. 16 from the St. John Utility Board to tie into the town’s water and sewage system. According to Jeff Dekker, president of the Dyer Town Council and member of the project’s design and construction team, the new campus will be developed in phases. The first phase will include construction of facilities that can accommodate 500 students. In later stages the existing structure will provide space for as many as 800 students. 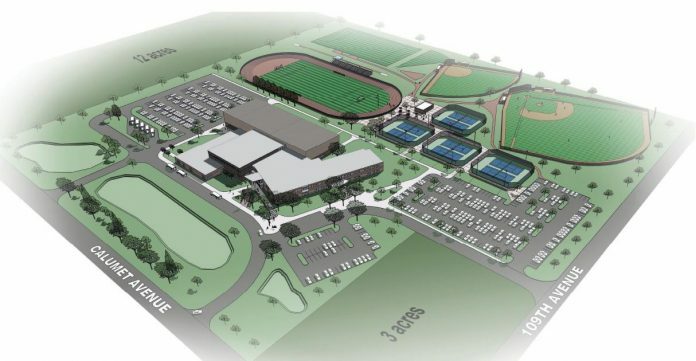 Illiana’s new campus will be built on a 37-acre site with space for new amenities including a full size track, on campus sports fields, auditorium and parking for faculty, students and guests. Among the new amenities, Illiana’s website highlights the communal Commons Area to encourage student relationships, collaborative learning and a sense of community. The cost estimate of the first stage of construction is approximately $25 million. The following phases have been designed so that the school board can select an option based on amount of funds raised. The final construction cost has been estimated to range from $39 to $40 million. To raise funds for the new campus, the school board established the Capital Campaign Committee which, to date, has secured approximately $20 million in cash and pledges. The remaining $5 million will be covered by a long-term loan.